*This page contains affiliate links. Purchases through affiliate links may provide a small commission to me. As a travel blogger, I have the opportunity to visit new cities and countries every year. Some places are a fun getaway, some are unremarkable, and some are so amazing that they are life changing. Alsace was life changing. I fell in love with this charming Franco-Germanic region, and I know I will be back. Alsace is known for its quaint villages, amazing wine trail, and delicious food. To access the various villages and almost 170 km of its wine trail, you must have transportation. I’m not a big fan of renting cars when abroad since driving and parking are kind of a hassle. So, what’s the best way to see Alsace without a car rental? That’s where Agnès and Arnaud of L’Alsaciette are an absolute must. 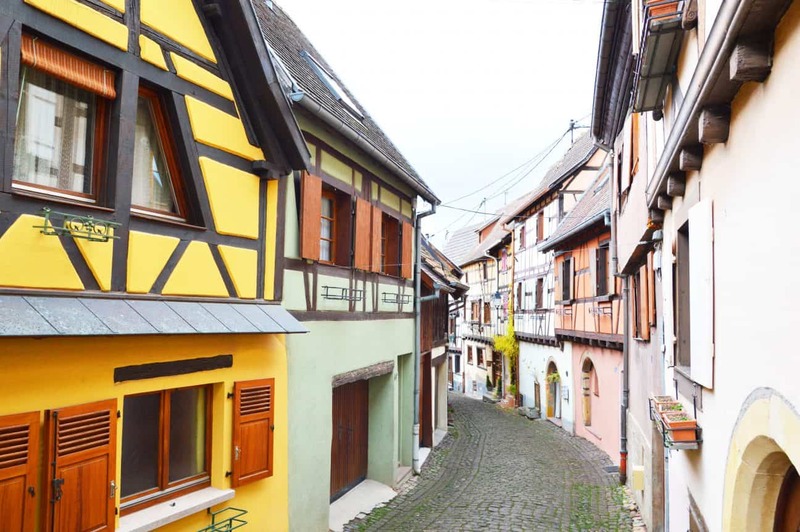 To experience the most comprehensive, fun, and delicious aspects of Alsace without a car of your own, you absolutely must take a tour with L’Alsaciette. Christmas decor covers the Customs House in Colmar. From Black Friday until the day before New Years’ Eve, L’Alsaciette runs the Magic of Christmas Markets tour. This year, 2017, it is November 24th through December 30th. How fortunate am I that I participated in the first tour of the year! It is a half day tour that packs quite a punch. In six hours, we visited four villages, three Christmas markets, two wineries and one vineyard. I saw more in a half day with L’Alsaciette than I did any of the other days I was in the region. 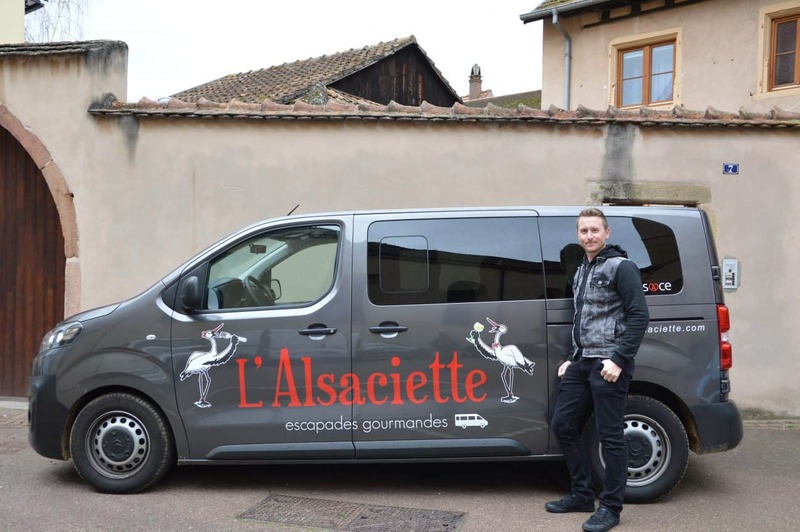 Here, Arnaud poses in front of one of the L’Alsaciette vans. With comfortable seating for nine people, air conditioning, and umbrellas in the event of rain, a day with L’Alsaciette is a pleasant ride. The Magic of Christmas Markets tour with L’Alsaciette is a half-day tour. This is great as it gives you the first half of the day to explore Colmar on your own or sleep in. If you are staying in one of the other cities or villages in the region, it allows time for you to make arrangements to meet at the Colmar train station, where the tour begins. Agnés and Arnaud are the owners and tour guides for L’Alsaciette. Best friends from Alsace, they know everything about the area. No matter what village you walk through, people greet Agnès and Arnaud like old friends. Agnès used to work in finance in Strasbourg and Arnaud was a landscape artist. They realized they both enjoyed teaching people about Alsatian culture and cuisine, and thus, L’Alsaciette was born. Agnès speaks four languages fluently: English, French, Spanish, and German. The Pigonnet, a spot in Eguisheim, where Villeneuve was inspired to write, Beauty and the Beast. 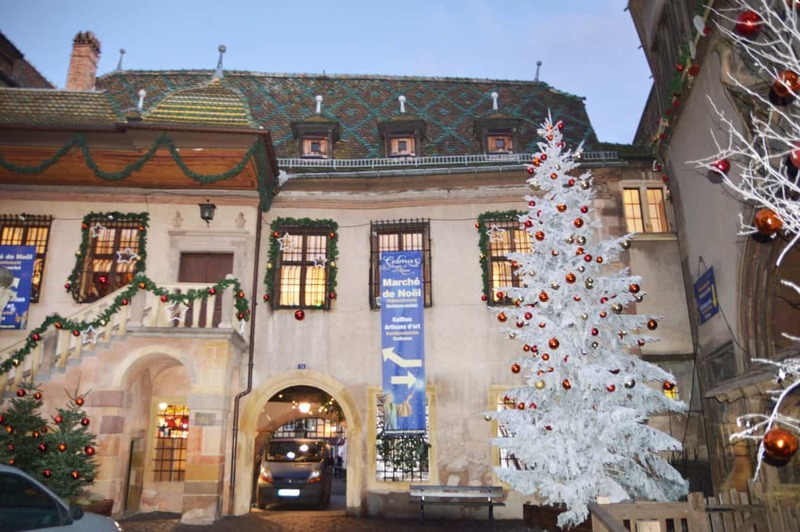 30% of all Alsatian tourists visit during the Christmas season. If you have a car, it is very hard to find a place to park. If you want to see Alsace without a car of your own, sign up for a tour with L’Alsaciette. At 89€, The Magic of Christmas Markets tour is an affordable option compared to some of the other tours in town. It allows you to see much of Alsace with a seasoned chauffeur, and without the headaches of managing a vehicle. Peaking down the Rue du Rempart in Eguisheim. Colorful shops and homes dot this circular road. Agnès and Arnaud picked me up at my lovely apartment in Colmar, part of Maison Martin Jund. Maison Martin Jund is a working winery dating back to the 16th century. I’ll tell you more about it in an upcoming post. It was a balmy, autumnal day reminiscent more of September than of late November. Our first stop was Eguisheim. Voted the favorite village of France in 2013, Eguisheim is a fairy tale dream. 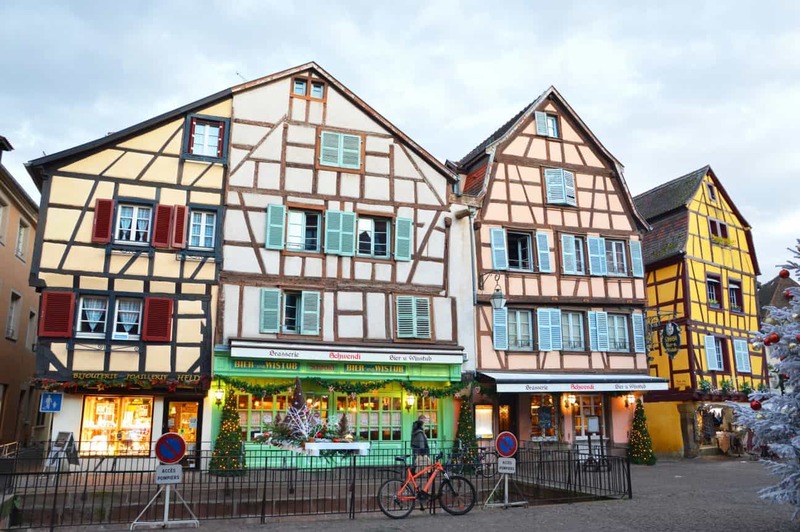 Where Colmar is a quaint, fairy tale city of some 125,000 people, Eguisheim is a tiny town of just about 1,500 permanent residents. The main streets of the town all circle the village, with some climbing up mild inclines and down gentle slopes. The half timbered homes and shops that line the village are required to be a different color than the buildings of their neighbors. The peaky roofs of these buildings are engineered so that gravity slides rain and even snow off of the buildings. There are many cute shops on the Rue du Rempart, and I ended up in one dedicated to mushrooms. There is mushroom decor, mushroom perfume, mushroom cookbooks, and of course, mushrooms. I purchased a dry mushroom sauce mix which requires the addition of heavy cream, crème fraiche, and water. I can’t wait to make a really hearty meal with aforementioned sauce sometime this winter. After completing a full loop of the town, we arrived to the main village square. Looking around the fountains and statues, you can truly see why this charming village inspired Beauty and the Beast. As is common in many Christian nations, the center of town focuses on the church. This church is especially important as it is dedicated to the first French-born pope of the Catholic Church, Pope Léon IX. Born in Eguisheim in 1002, he was a known as a champion of peace and of wanting the Catholic Church to embody Christianity while combating corruption and nepotism. 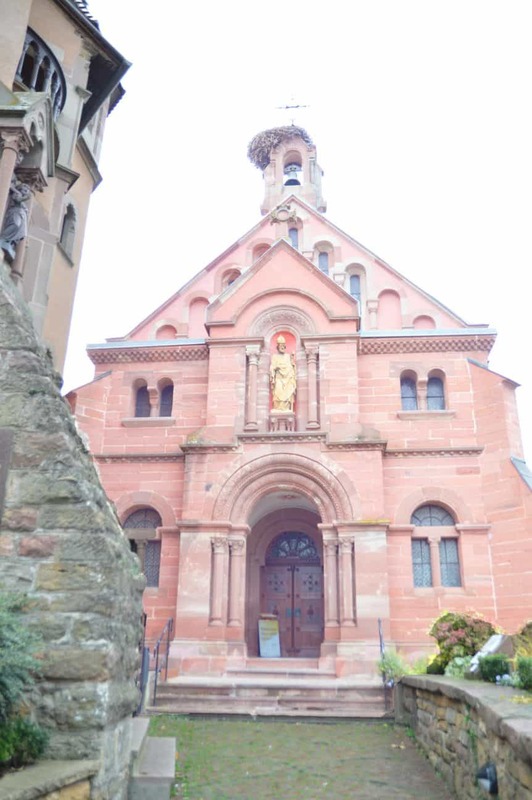 This church is dedicated to the First French Pope who happened to be born in Eguisheim, Pope Léon IX. Notice the enormous stork’s nest on the top! Storks are prevalent in the area, and on the logo of L’Alsaciette. 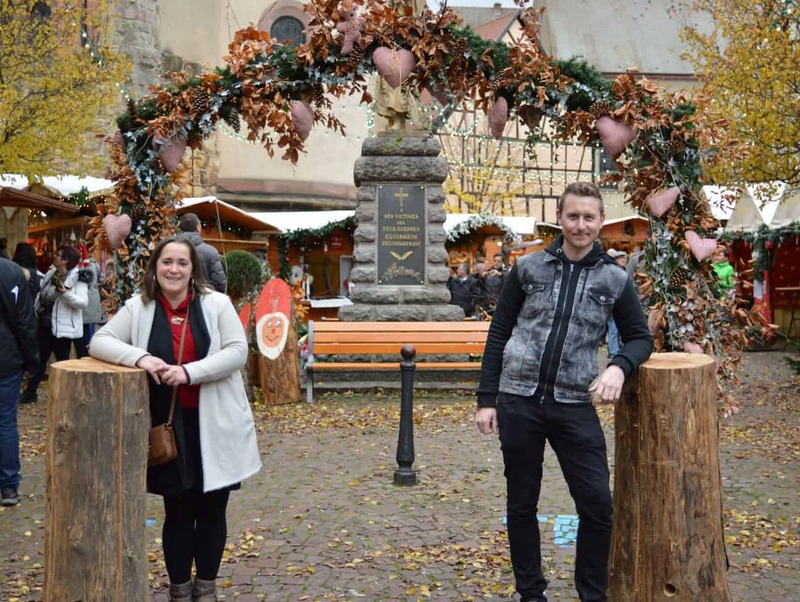 Agnès and Arnaud, the proprietors of L’Alsaciette, at the entrance of the charming Eguisheim Christmas market. In Eguisheim, I chose to keep my souvenir cup. 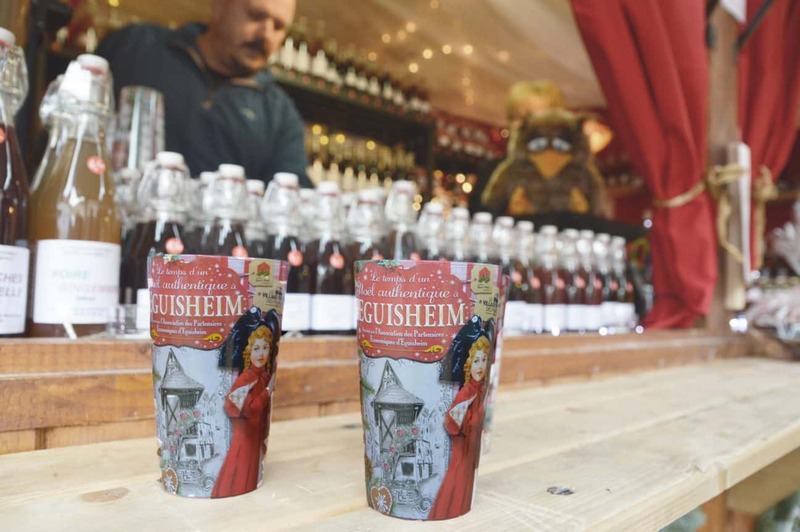 The gluhwein was tasty and hot, and the people running the stand were delightful and funny! Enjoying Gluhwein with Agnès of L’Alsaciette. Isn’t the stand behind us just adorable? While in Eguisheim, we stopped at our first winery for a tasting. 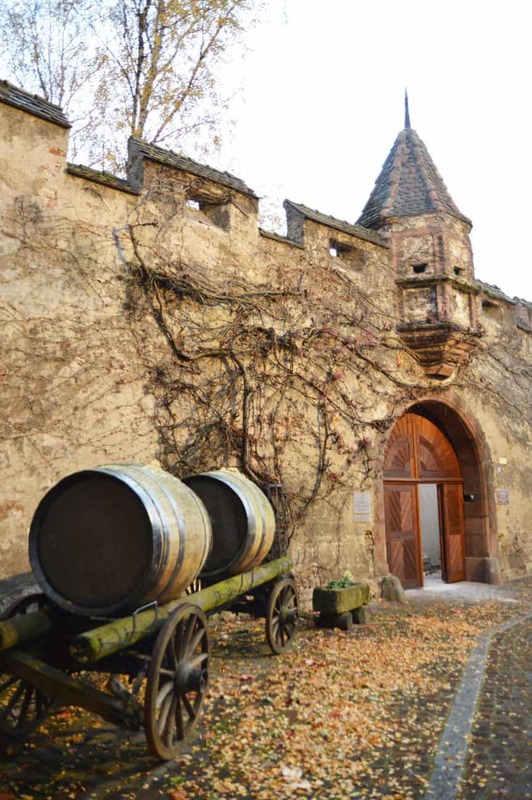 Domaine Bruno Hertz is a working family winery dating back to the 1700s. Currently, there are three generations of the Hertz family that work at the winery. They have seven different cépages, or variety of grapes. We tried riesling, gewurztraminer, and the single red varietal of the area, pinot noir. My favorite was one of their grand cru varieties, the Rangen Alsace riesling from the slopes of the Rangen mountain in the Vosges. Along with the wine, L’Alsaciette provided quite a delicious spread of foods to try. Among the offerings were a tasty tarte flambée, the traditional flaky and light cheese tartes of the region, and my favorite, salade vigneronne. A vinegary antipasto of pork, cheese, and cornichons, this treat was sublime! Take a peek at the videos above and below to see inside the winery as well as to see the great wines available. Domaine Bruno Hertz and its wine caves are open to the public. The caves were built with borders of the walls from the original fortifications of the city. Behind these massive barrels you’ll see very dated bricks from those walls of protection. 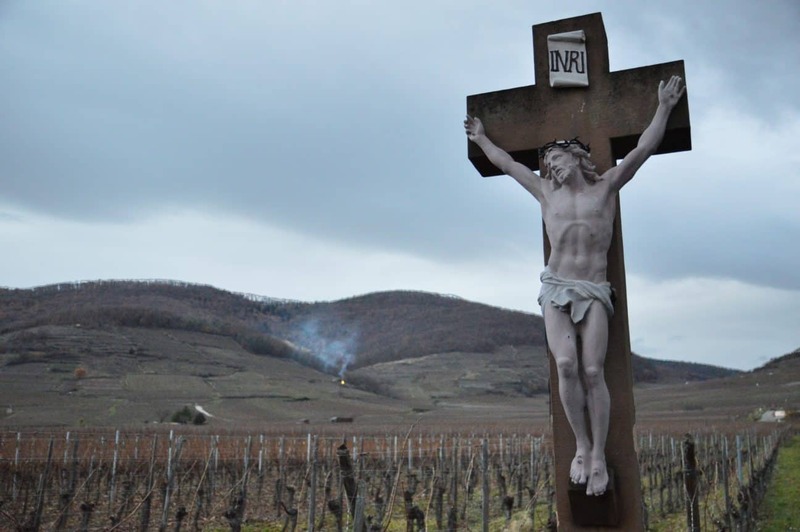 After tasting five wines at Domaine Bruno Hertz, I was beyond glad that I wasn’t driving. One of the perks of booking a tour with L’Alsaciette is that you can visit Alsace without a car hindering your ability to participate in wine tastings. 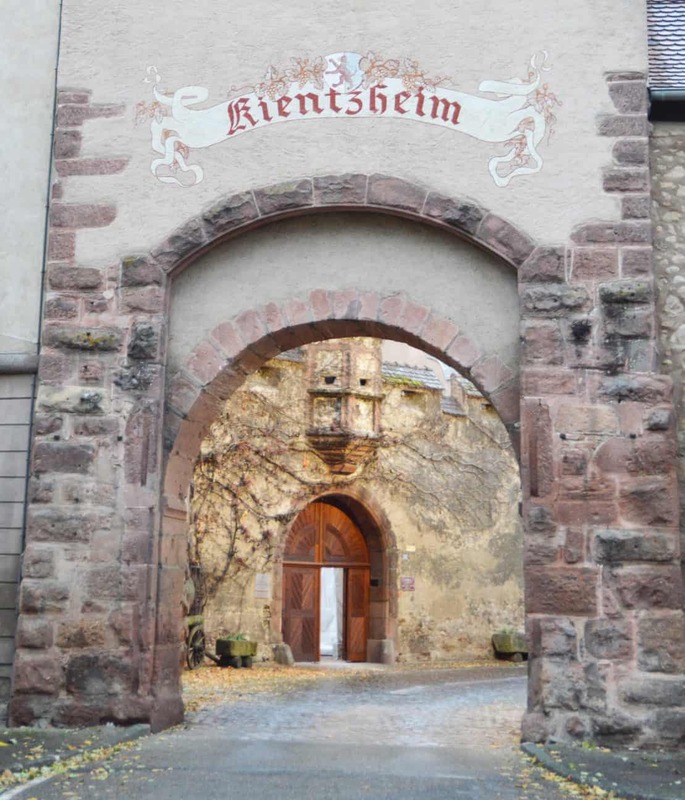 The beautiful entry gates to the hamlet of Keintzheim in Alsace. Keintzheim is the only Alsatian village to have its entire protective wall completely in tact. You will not read about Kientzheim in any of your guidebooks. If you rented your own car, you would probably drive right past it. 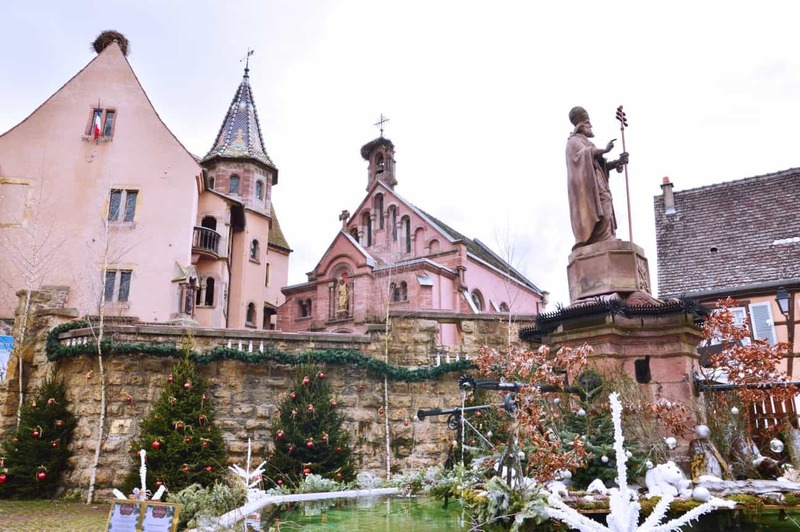 If you visit Alsace without a car of your own and instead book a guided trip with L’Alsaciette, Agnès and Arnaud will share this hidden gem with you. When you visit, take note of the town’s most famous event, the Confrérie Saint Étienne. Dating back to the 14th century, this group of distinguished notables would rank the very best wines of the region every year on December 26th. Today, the confrérie has a gorgeous chateau with private rentals and events. The Confrérie Saint Étienne is still considered the gold standard in judging wines from the Alsatian region. The entrance to the buildings of the Confrérie Saint Étienne. After a quick peek into a private event at the Confrérie Saint Étienne, we took a walk around the outer wall of the city. Even in November, flowers were in bloom and people were tending to their gardens. While most of my time in Alsace was spent inside the walls of Alsatian villages, in Kientzheim we walked outside of the wall and amongst the vineyards. The view from the road near Kientzheim. While the harvest was over for the season, a controlled burn in the distance filled the air with the smell of autumnal leave cinders. As I was in Alsace without a car, I only traveled around Colmar by foot. It wasn’t until I went on my tour with L’Alsaciette that I was able to see much more of the region thanks to a comfortable van and expert tour operators. Knowing that I was an American, L’Alsaciette took me to two places that completely surprised me. First, we stopped by a monument honoring the American participation in liberating Alsace during World War II. 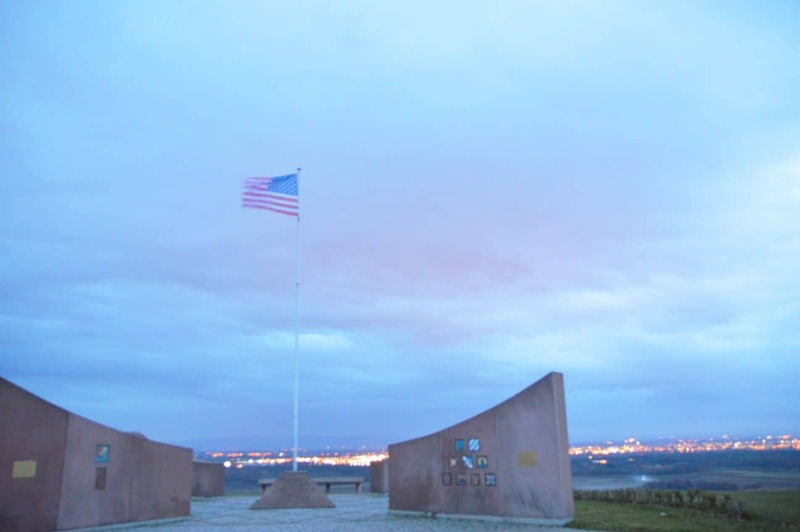 Known as “Bloody Hill,” it was quite the sight to see an American flag waving high above the Vosges Mountains. As night fell, we made our way to Riquewihr, the last stop before returning to Colmar. Riquewihr is chock full of gorgeous homes and has the most stone buildings of any other village in the region. Because of its location amongst hundreds of hectares of vineyards, it was one of the more wealthy villages from centuries past. 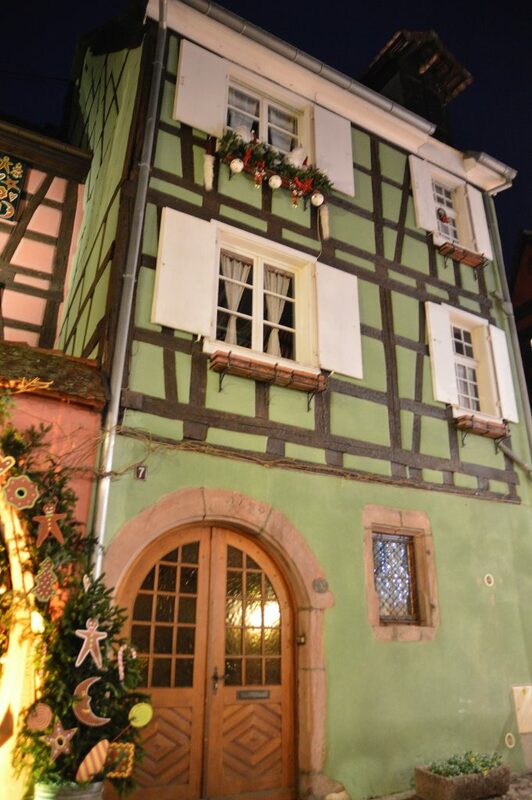 Seeing Riquewihr at night allowed me to take in the whimsy and tradition of the Christmas decor. Seeing the shops and homes so ornately decorated was stunning. Walking under illuminated ornaments in the trees was a great way to take in the Christmas market. Lucky me! As I was in Alsace without a car or the responsibility that comes along with it, I was able to enjoy a final stop at another wine house, Dopff au Moulin. 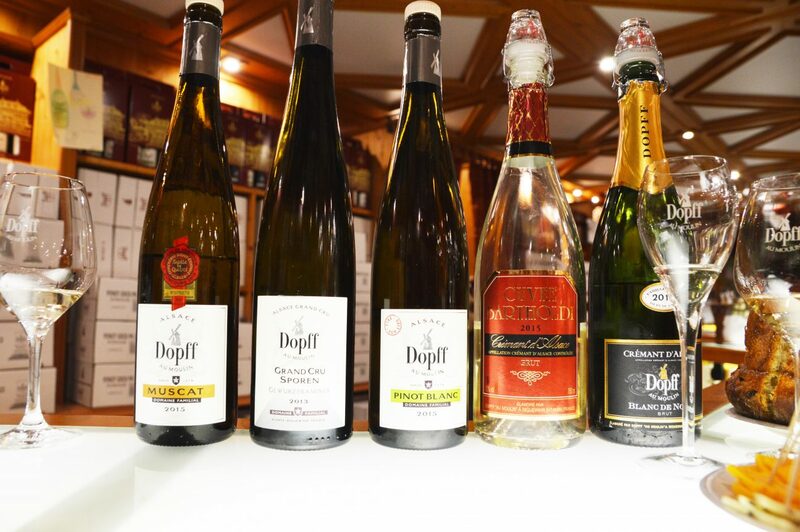 Founded in 1574, Dopff au Moulin has, for 11 generations, owned and acquired some of the most coveted vines in the regions. Most notably, Dopff au Moulin is known as the first winehouse to make sparkling wine in the “méthode Champenoise,” the Champagne method. Groundbreaking and delicious, this wine, known as Cremant d’Alsace, was an incredible hit and remains so today. 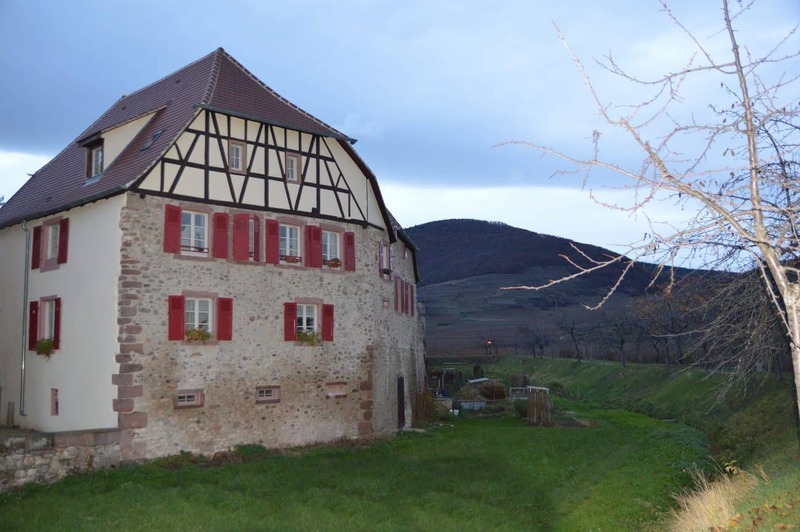 As one of the first wine houses to make a livelihood of their craft, Dopff au Moulin is an anchor of winemaking in Riquewihr. 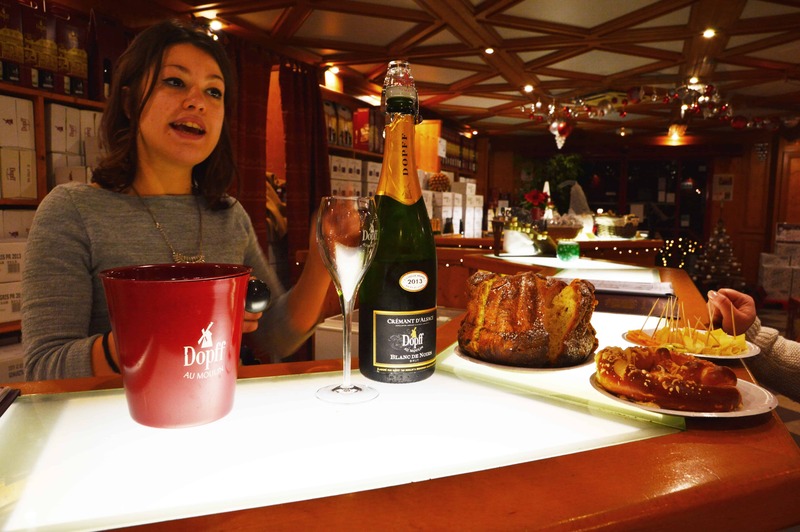 The first order of business was to try the Cremant d’Alsace, Alsatian sparkling wine that originated at Dopff au Moulin. Here, Ingrid of Dopff au Moulin gives an insightful lesson on the wines of the house. 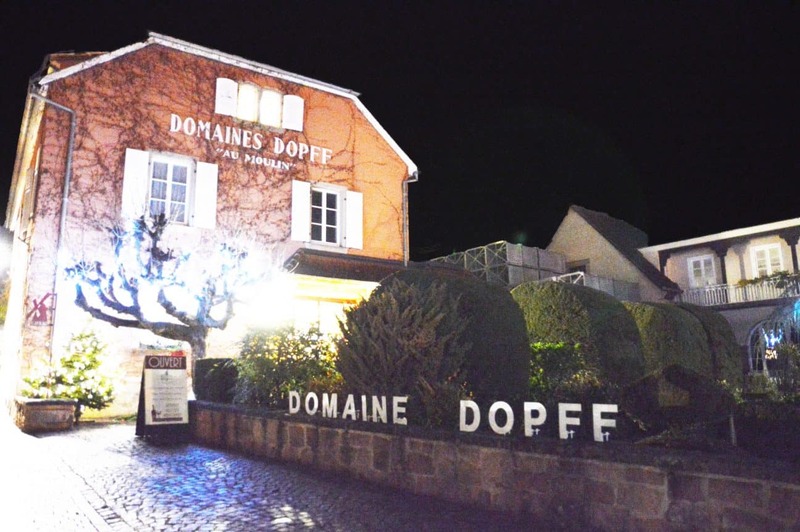 There are two tasting rooms for Dopff au Moulin in Riquewihr. The first is at 3 Rue Général de Gaulle in the Old Town, and the larger room is at the domaine house, located at 2 Avenue Jacques Preiss. I visited the domaine house, which is charming and beautiful all at once. As accompaniments, traditional Alsatian dishes of cheese, pretzels, and kugelhopf were paired with the wines. I tried all five of the wines, and even participated in a blind tasting of the muscat. There were two cremants, one made of red grapes and one of white grapes, one pinot blanc, one muscat, and a grand cru of gewurztraminer, from the mountain side of Sporen. 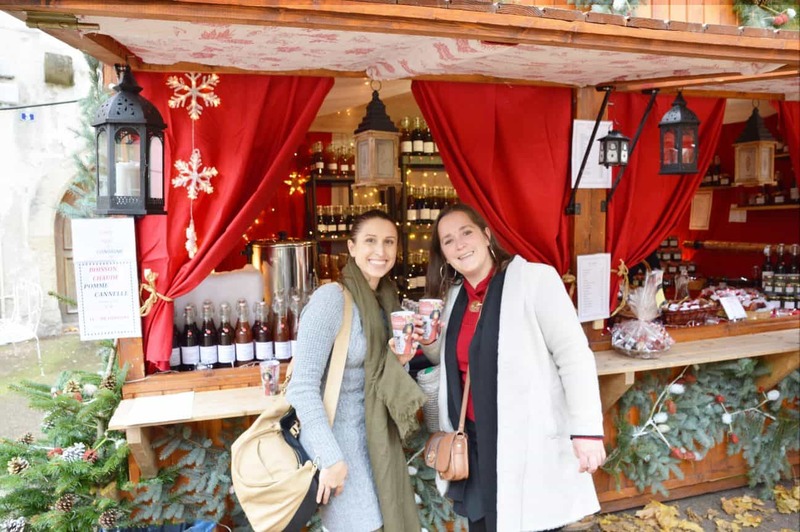 After a lovely afternoon and evening around three villages of Alsace, the final stop on the L’Alsaciette tour was in Colmar at the Maison Martin Jund stand for gluhwein. 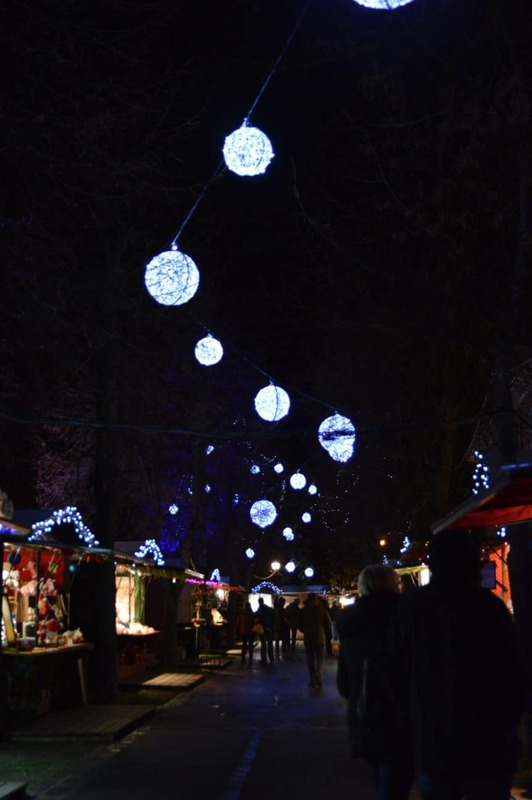 As it was the first day of the Christmas markets, it was a festive night in Colmar. One of the best parts about a tour with Agnès and Arnaud of L’Alsaciette is the authenticity of it. Walk around Alsace with these two folks and you feel as if you are with celebrities. People on the street shout greetings and hug them as they walk through the villages. Since they both have been in the area since childhood, they know every local place to visit and have some of the best recommendations of places to eat––a post on that soon! I highly recommend booking a tour with L’Alsaciette. It is a great way to see Alsace without a car in order to safely and economically enjoy the villages and wineries of the region. My day with L’Alsaciette was by far my favorite day in Alsace. While I participated in a seasonal, “The Magic of Christmas Markets” tour, L’Alsaciette offers four year-round tours. 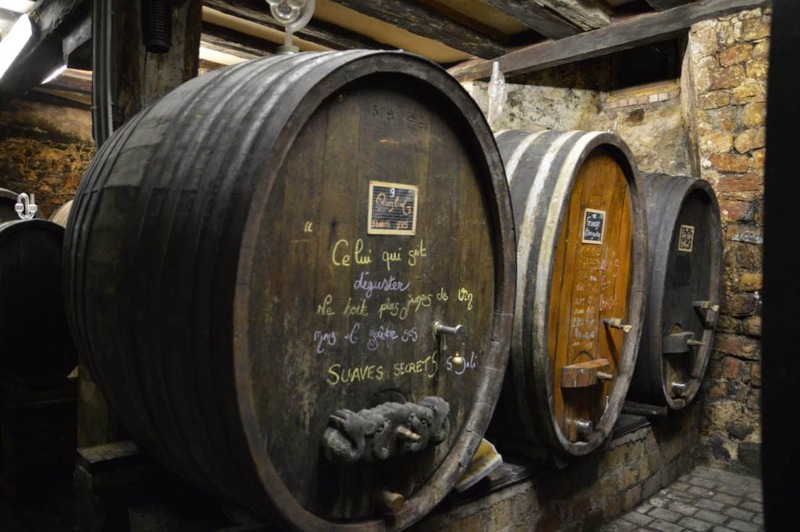 They are: a full day tour of Alsatian specialties along the Wine Route, a full day tour of the Munster Valley, a full day tour of vineyards, and a half day tour of Alsatian villages. All of these tours include wine tastings and plenty of delicious dishes. Varying between 79€-169€ per person, these tours are incredibly well priced for the amount of food, drink, and fun to be had. No matter what time of year, when in Alsace without a car, book a tour with L’Alsaciette. Many thanks to L’Alsaciette for sponsoring this tour including Dopff au Moulin and Domaine Bruno Hertz. As always, all opinions are my own. All these places and good food and wine? Sounds like fun. So pretty too. Oh wow, such a detailed post. 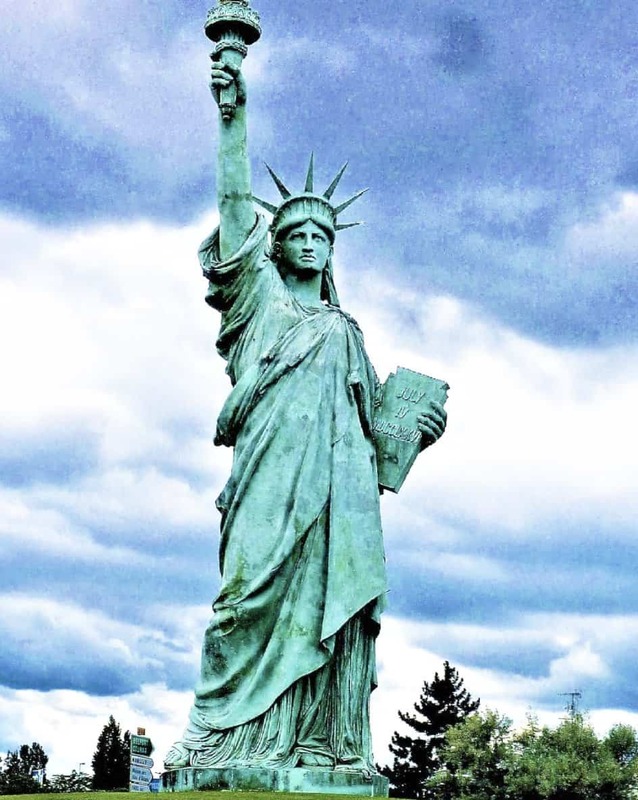 This region looks picture-perfect and so interesting re the Statue of Liberty replicas. It really is impossible to park around Christmastime. It’s a testament to how beautiful the area is in your return three years in a row! I actually did not make it to Kayserberg but hopefully next time. This place looks amazing. I lived in Europe for awhile many years ago but never made it to Alsace. I love all the Germanic style architecture and the small winding side streets to explore. 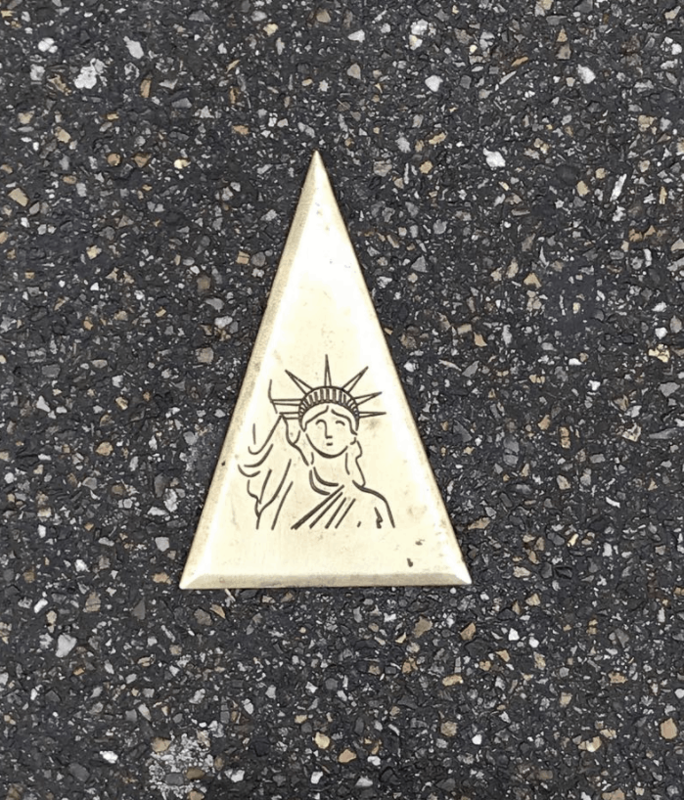 I didn’t know they had one of the Statue of Liberty replica’s. The walled cities are always cool to explore and it seems almost every town has a brewery or winery that you can visit. I didn’t know you lived in Europe, Bob! Where did you live? A far cry from Texas, no? 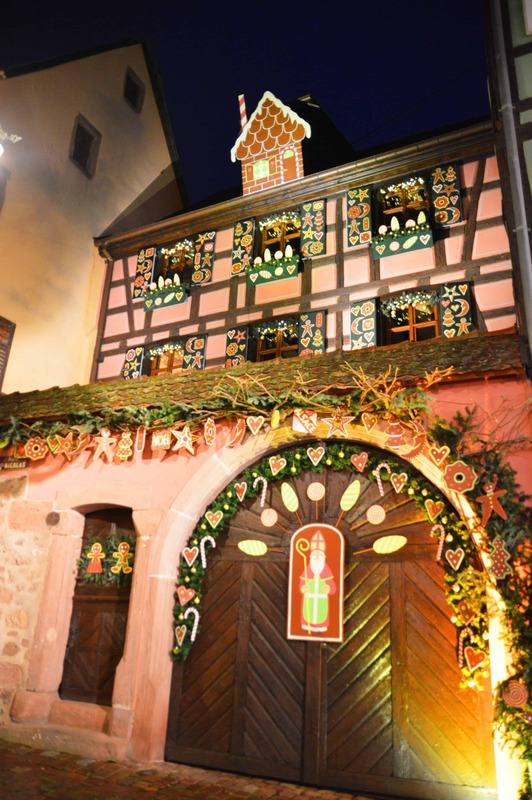 How lucky to be in Alsace around Christmas time and how lucky to participate in the Magic of Christmas Markets tour. It seems like a great way to explore this beautiful region. I was born and raised in Europe, but I haven’t visited Alsace yet. Your post gave me some great ideas about traveling there. I wish I could go in December too because the magic of Christmas in Europe never ceases to amaze me. However, traveling to Europe at that time of year is more difficult and expensive. I didn’t realize that it was a popular time to visit Europe until the last few years. I think southern Europe is more off season at that time of year, do you think that’s true? I love Christmas the markets and the European towns that go to the effort to do this type of thing. 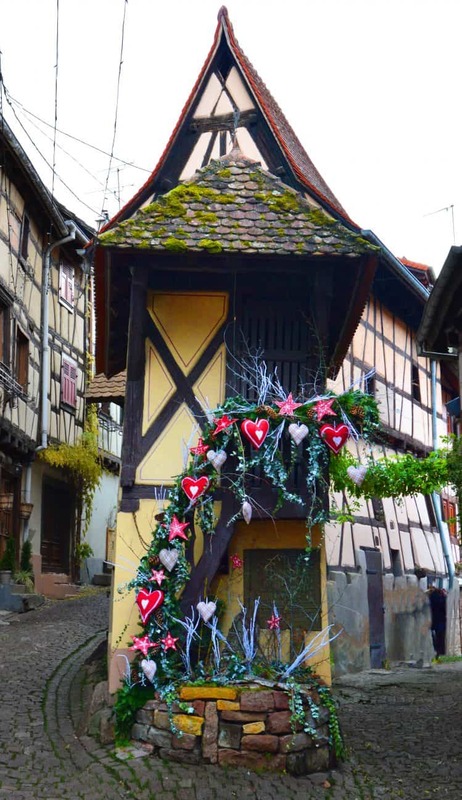 I am from the UK and I have never visited Alsace but this has given me a few ideas on the lead up to Christmas.